Welcome to the February 2019 We Create BLUSHING Blog Hop!!! This month we are creating projects using pinks and reds! My card features the Meant to Be stamp set, which is in the 2019 Occasions Catalog that debuted January 3rd. 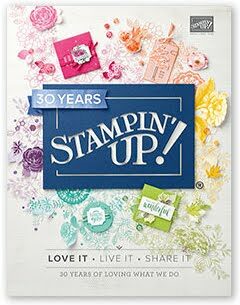 I'm also using the So Hoppy Together stamp set you can earn as a FREE Item during 2019 Sale-a-Bration! 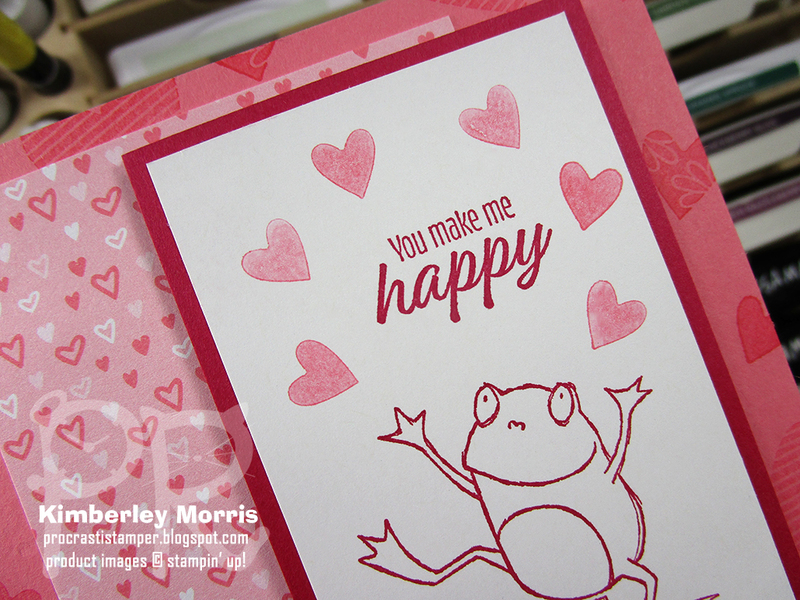 I think adding the frog from the So Hoppy Together stamp set alongside the hearts makes a great Valentine card for a special person in your life who brings you joy, but maybe someone you are not super close friends or partners with. It's cute and sweet, but not too lovey-dovey. You could even leave the ribbon off, if that's one step too far for you! I love this frog on the unicycle, he looks like he's ready to juggle something. So, I gave him some hearts to toss around. Lol, that sounds pretty callous...let's just clarify that they are candy hearts! They are inked up in Flirty Flamingo, but I stamped them off once before stamping them on the card, so they'd be just a little lighter. 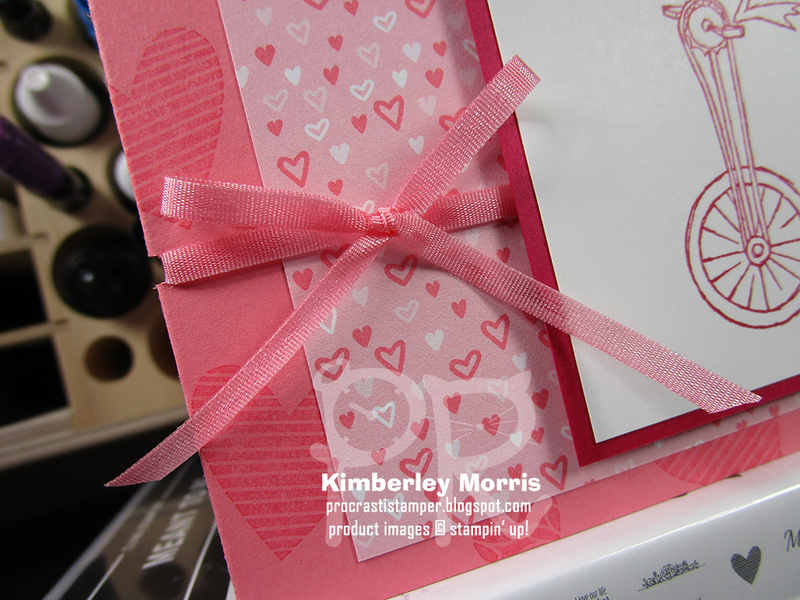 To keep the ribbon in place, I used the 1/8" Handheld Circle Punch to make a little notch on the fold of the card. It's an old trick, but it's sure handy. This Flirty Flamingo colored ribbon is one of two ribbons in the All My Love Ribbon Combo Pack. 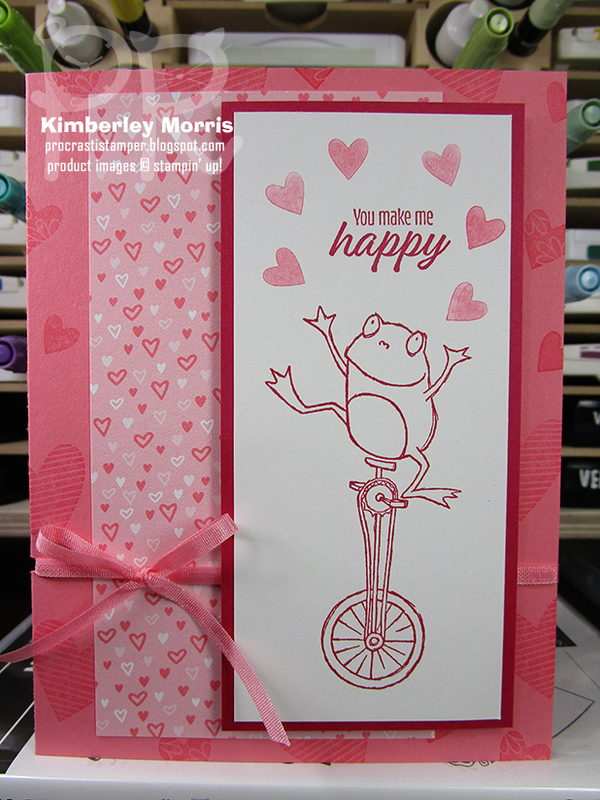 The other color is Lovely Lipstick, which is actually the color I used to stamp the greeting and the froggie. 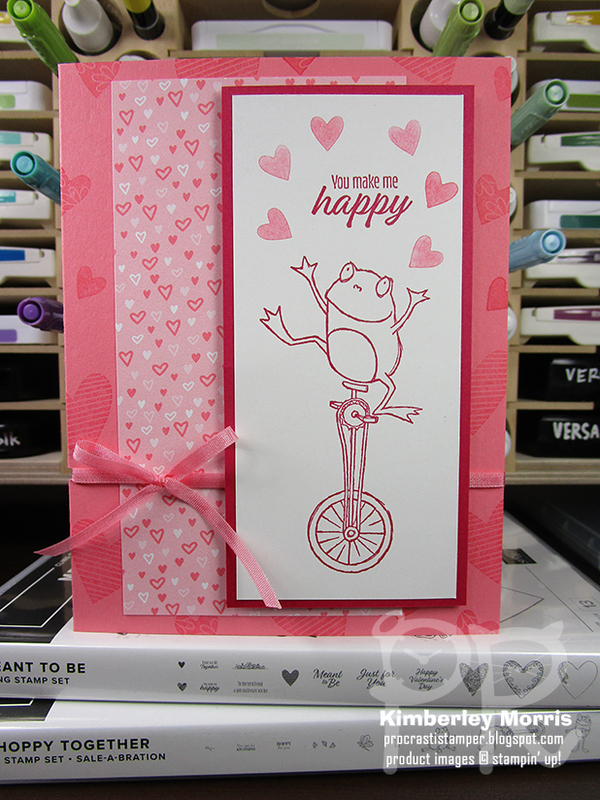 The little hand-drawn hearts on the All My Love Designer Series Paper look great alongside the cartoon-style frog, and the colors coordinate perfectly. One last tip...the base of the card is Flirty Flamingo Cardstock, and I stamped 3 different hearts from the Meant to Be stamp set on it. However, I stamped them all OFF once before stamping on the card base. It gives the background some visual texture, without being so dark that they compete with the focal point images. BREAKING NEWS: I've just learned there are coordinating Framelits available for purchase, to cut out images in the Sale-a-Bration FREE So Hoppy Together stamp set!!! I'll be sure to add the info/image here as soon as I get it. Stampin' Supplies: Meant to Be stamp set, Sale-a-Bration FREE So Hoppy Together stamp set, Flirty Flamingo Cardstock & ink pad, Lovely Lipstick Cardstock & ink pad, Whisper White Cardstock, All My Love Designer Series Paper, All My Love Ribbon Pack, 1/8" Handheld Circle Punch, SNAIL Adhesive, Stampin' Dimensionals, Simply Shammy (to clean stamps), Stampin' Trimmer (to cut & score card stock). Don't forget Whisper White Medium Envelopes to mail your cards!